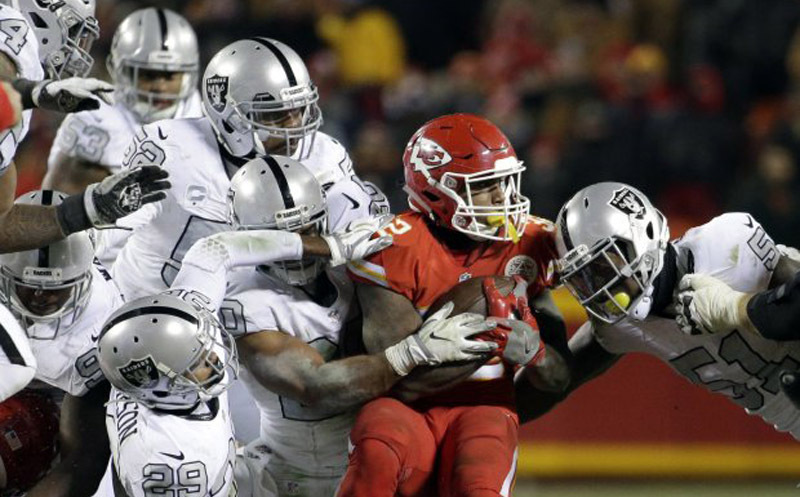 The string of interesting Thursday Night Football matchups (something I never thought I’d write) continues in Week 7, with the Kansas City Chiefs traveling to Oakland to take on the Raiders. Pinnacle opened this game at Kansas City -3 (+111) with Bookmaker offering a plus money -3 (+101) as well. At the time of publication, the line has settled in at -3 (-101) behind 73% of spread tickets and 79% of spread dollars backing the Chiefs. While sharp money entered the market to grab Oakland earlier in the week, more has sided with the public and come down on Kansas City over the past 48 hours. The line has remained at 3 for a couple of days now, but there is still some time for action to move the line off of that key number. Bettors interested in this game should also take note of the weather report, which is forecasting a steady diagonal crosswind of close to 10 mph. 49% of bets and 59% of dollars are on the under and the total has gone from 47.5 to 46.5 since opening. For real-time odds and betting percentage updates for this and all NFL Week 7 games, please visit our Free NFL Live Odds Page.